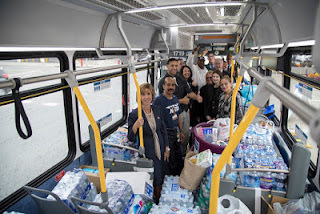 After making several stops around Buffalo, Metro ended up delivering a full bus load of supplies, filling more than 50 pallets at the Connecticut Street Armory. NFTA employees donated time, goods and money to the effort. Special thanks go out to both Crowley Webb and the Church of Igelsia Pentecostal Camino De Santidad, Inc. Both organizations held their own drives, which the NFTA could support with transportation.